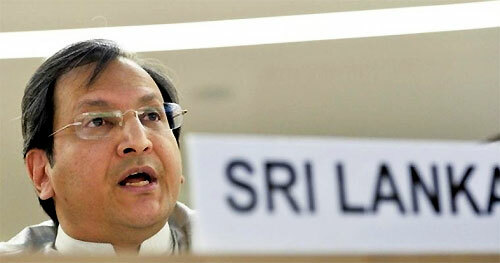 Sri Lanka has never shied away from taking its fair share of responsibility in the UN system, which has helped Sri Lanka build an image as a moderate and progressive partner, able to bridge differences and build consensus, Sri Lanka's Ambassador to the UN Ravinatha Aryasinha said. He made these observations when he addressed representatives of the diplomatic community, UN and other international organizations at a ceremony held to celebrate Sri Lanka's 70th Anniversary of Independence at the World Intellectual Property Organization (WIPO) on February 6. Ambassador Aryasinha also said Sri Lanka continues to give leadership on a wide range of issues such as disarmament, migration, human rights, health, intellectual property, science and technology and international trade policy in Geneva. Sri Lanka's Permanent Representative to the World Trade Organization Ambassador R.D.S. Kumararatne, Deputy Permanent Representative to the UN Mrs. Samantha Jayasuriya and Mission staff were associated with the Ambassador at the event. The centre piece of the Geneva celebrations was an exhibition titled 'Facets of Sri Lanka', conceptualized and organized by the Sri Lanka Permanent Mission in Geneva, in collaboration with the World Intellectual Property Organization (WIPO). Ambassador Aryasinha said 'Facets of Sri Lanka' was an opportunity to salute the work done by all the previous Ambassadors and staff who served in the Mission in Geneva, Sri Lankans in the International Civil Service and other Missions in Geneva, colleagues from diplomatic Missions, the UNOG, UN agencies, WTO and other international organizations, who over the years, have supported Sri Lanka, and contributed to Sri Lanka’s standing in Geneva.